Kutwanana is a small NGO, registered with the Mozambique government, set up by the Machava church that Patrick and Grace Mulenga pastor. The community is huge, no one knows the figure but it is hundreds of thousands of people. The programme has 35 volunteers who visit around the community finding the needy and helping them. More than 200 orphan children are being cared for. Back in 2001 Bright Hope World first visited Kutwanana. It was just getting off the ground and there was plenty of vision but little developed strategy. We continued to communicate with the leaders and in 2004 we helped by purchasing a number of sewing machines to assist people to learn skills and a trade. 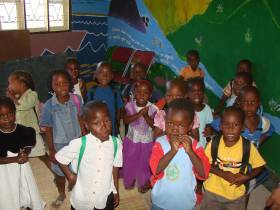 Then in 2005 we commenced funding a programme for the care of orphans and vulnerable in Machava. As the newly planted church developed they discovered that there were many people in the community who were very poor, very sick and very lost. They began a group to go into the community to visit and assist people in their homes. They were shocked by what they found, people left dying in their homes uncared for, child / orphan led households with absolutely no resources, many orphans and many children not going to school for a host of reasons. They began a small school in the church building and ran it for a number of years. The children who attended were not going to local schools as it was too expensive. The teachers were the young people of the church who were studing in the mornings and teaching in the afternoons. However, after doing this for a few years, the government introduced free education. And, although it's not entirely free, it was felt best to send the children to these schools rather than run their own. 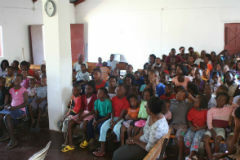 The funds initially used to fund the children at their own school are now being used to support them at local schools. The beneficiaries are primarily the orphans and vulnerable children of the Machava community who are sponsored to school. Patrick and Grace Mulenga are Zambians. 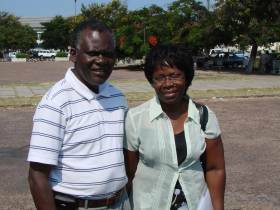 They left Zambia in the late 1980's and after three years in Zimbabwe came to Maputo to plant a new church. Since then they have been developing a ministry in the suburb of Machava. Their first priority has been the establishment of a strong church base in the community and there are now two other preaching points set up in other parts of the city as well. However the Kutwanana Home Based Care partnership takes most of their time and energy. They have four children. All of them are in the process of education either in Maputo or South Africa. The actual budget required annually for this programme is US$16,000. Currently Bright Hope World sends US$8,000 annually but we are keen to increase this if more funding becomes available. Paulo Naena’s father died in the war and had been a pastor in an AOG Church. He was 9 years old when his father died. His mother left him with an uncle and moved to another town. His uncle died and then he lived with an aunty for a while and then she moved to South Africa. He was alone and vulnerable and then he met Patrick who invited him to live with his family for several years. He is very grateful for the loving home environment he lived in with the Mulenga family. 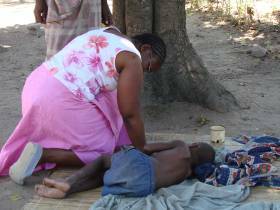 Patrick discipled him and he is now keenly serving God and helping the poor, needy and vulnerable. He cannot imagine what life would have been like if the Mulenga's had not taken him into their family and he is very thankful to them and to God. Paulo assists Grace to confirm that families who want their children assisted at the school are really orphans. He spends a lot of time with Grace interpreting the various languages that people speak when they come to the centre. Benilda is a very attractive 16 year old who has a delightful smile, laughs a lot and has happy smiling eyes. Her life has already had a lot of sadness for such a young person. Her mother and father died several years ago and she is being cared for by an older brother. When she was 3 years old she went to hospital with malaria and sadly she is now unable to hear or speak clearly. Benilda was one of the first trainees for the sewing programme back in 2004 and now continues to work as a seamstress making clothes and other goods for sale. She is very talented and works hard. She attends Bible study and wants to be baptised soon. She has a very outgoing personality and always has a crowd of people around her. She loves the Mulenga's and comes and goes from their place like she is one of their own children.